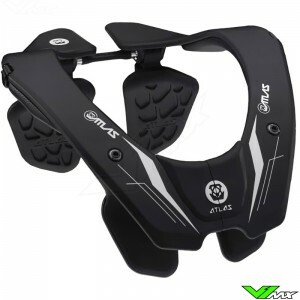 Protect your neck with the extensive range of motocross neck braces at V1mx. What does a neck brace do? A motocross neck brace is designed to keep away forces from your neck and prevent your neck from bending too far. During an accident your motocross helmet can hit the ground, causing stresses to be exerted on your neck. The top of the neck brace has a large flat surface which makes contact with the motocross helmet. The forces that come on the motocross helmet during the accident are then passed through the brace, instead of your neck. The neck brace then distributes the stresses over a larger surface on your back and chest. 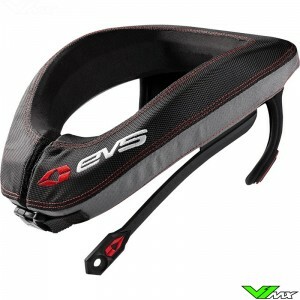 V1mx provides neck braces from well-known brands such as Alpinestars, EVS en Atlas. These brands are specialized in making high quality protection for motocross riders. A lot of research and testing with professional riders has ensured that the latest forms of protection have minimal compromise on the freedom of movement of the rider. 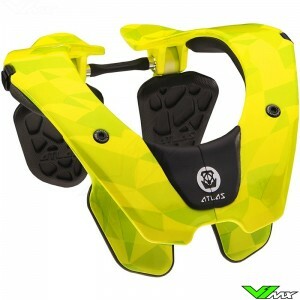 The neck brace from Atlas is very flexible. This makes it more comfortable to wear and offers better dampening during an impact. 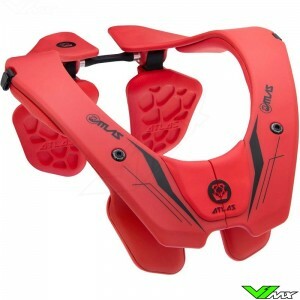 The Atlas Air is now one of the most popular neck braces among motocross riders. In addition, the Atlas neck brace is available in a wide range of colors and designs. 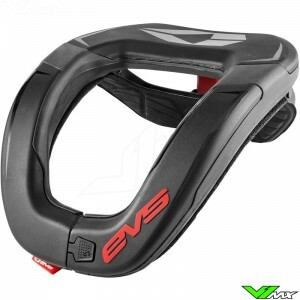 The American company EVS is known for its high-quality protection for motocross riders. Their neck brace and collars have been developed and further refined utilizing testing data and feedback from test riders on the track and on the trails. The neck protection is designed to minimize the risk of axial compression, hyperflexion, hyperextension and lateral hyperflexion. 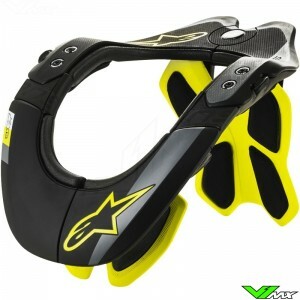 The motocross neck brace from Alpinestars is made from carbon composite to keep the weight as low as possible. A unique feature on the Alpinestars neck brace is the possibility to connect it to your Alpinestars body armour. Almost all of their body armour have compartments where the neck brace can be placed. In addition, a pull tab on the body armour can be attached to the neck brace. This keeps your protection in position, even during a heavy crash. 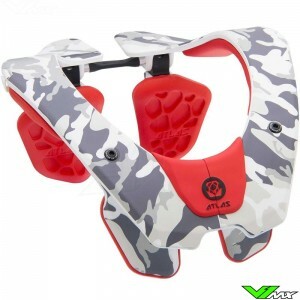 At V1mx you can choose from a wide range of neck braces which are specifically designed for motocross use. Do you have a question about one of these advanced products or about placing an order? Feel free to contact the V1mx customer service. We would be happy to help you choose the right protection.